I'm pretty sure you noticed the buzz about the now famous 10,000 Roses Cafe in social media last year. Located in Cordova, Cebu, people flocked in like crazy just to get the perfect Instagram and Facebook shots. In fact, sad news were circulated that a lot of the artificial roses got damaged. The hype about the famous cafe went on for months. But now that the buzz has died down (a little bit), I finally gave in and went there, together with Sheen and Zayn, to check it out and see if it's really worth the hype. It was last Saturday, January 20, when we made a quick visit to 10,000 Roses. Since we're living in Lapu-Lapu City, we directly rode a jeepney going to Cordova and dropped off at Gaisano Grand Mall. Fare was Php 10 each. From Gaisano Grand Mall, we rode a tricycle going to 10,000 Roses and paid Php 60 for pakyaw. Upon arriving at 10,000 Roses, we paid a Php 20 entrance each except for Zayn. I was not able to ask what age bracket was exempted of the entrance fee though. We arrived there at around 10:30AM to make sure there won't be a lot of people in the place. To be honest, 10,000 Roses wasn't disappointing. I like it there actually. 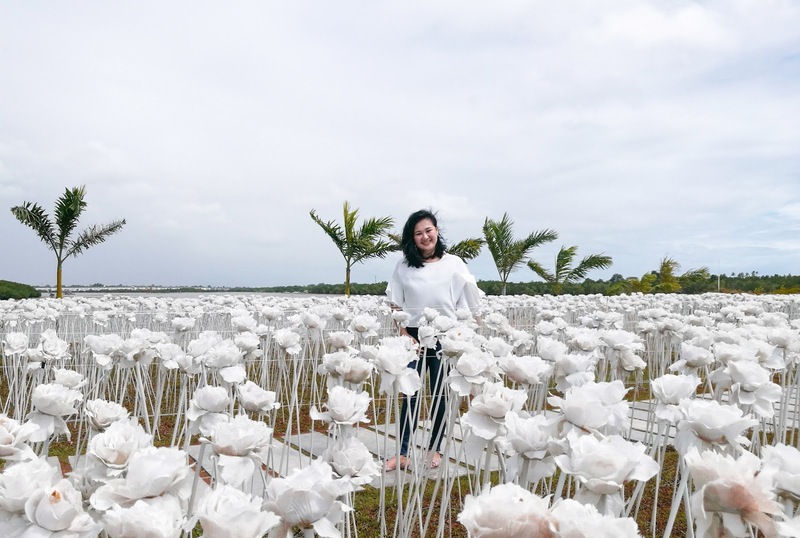 The concept is cute and I think they're the first in Cebu to make a tourist attraction out of LED-powered roses. No wonder people were crazy about it. Because you know how people are when there's something new, right? I also love that it's located near the sea which adds more "dramatic" effect to the place. You can even view mainland Cebu from there. If you've been there before, you will definitely notice that there are already a lot of changes to the place. The 10,000 Roses Cafe itself had a major design change and their al fresco dining was improved as well. I would've loved to try the food in the cafe but we had another plans that day. Maybe next time. Overall, I have to say that 10,000 Roses is indeed worth the hype. The place is beautiful and I hope we all keep it that way. Because it's so sad to see news on how people can be so aggressive just to get their photos that they don't care about destroying the place anymore. So please always remember, "Take nothing but pictures. Leave nothing but footprints." Wow, LED roses? That actually sounds like such a cool attraction! I'm glad it didn't disappoint. I like this review post from you, it's honest and not sugar coated :) I want to see this place too the next time I pass by Cebu. paano po sumakay pabalik? hindi po ba mahirap ang transpo? Not really though. We walked for a bit going back and then may mga "padyak" naman na naghihintay and you can ask them to take you back to Gaisano Grand Mall Cordova. Then sa Gaisano Grand Mall, marami na multicabs (jeep) to take you to where you are going.